A City & Guilds qualification shows that you have the ability to do a job to an industry recognised standard. 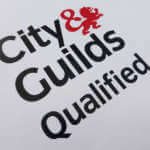 Using the City & Guilds Qualified logo on your website and advertising is a great way to demonstrate your qualifications. If you have passed the City & Guilds 2377-22 course, you can apply for the Qualified logo by emailing your request with a scanned copy of your certificate to logo@cityandguilds.com. City & Guilds is the most widely recognised awarding body in the UK. It offers over 500 vocational qualifications and has awarded 20 million people a qualification since the year 2000.